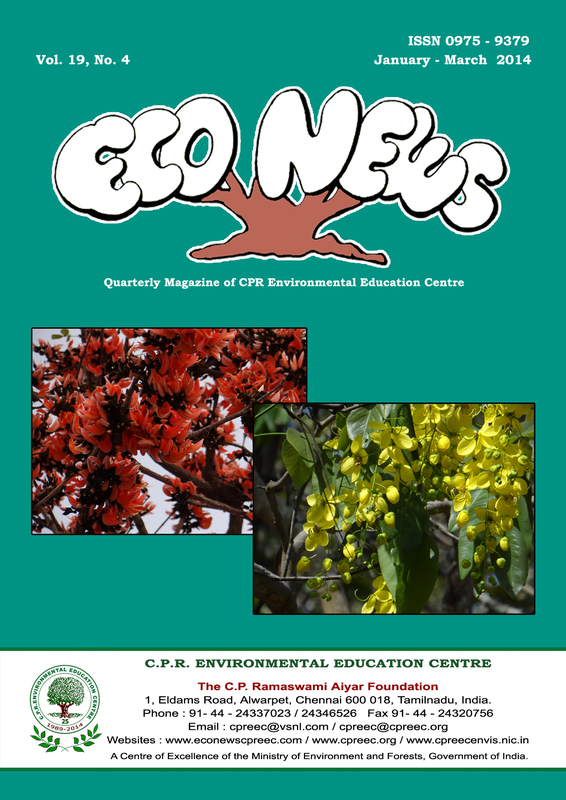 http://www.econewscpreec.com is the new name for this publication which will cease to be printed from April 2014. It will be an online magazine and there is no charge for subscription. The reason for this change is because it has become difficult to get tree-free paper and we do not believe in cutting trees to say “Don’t Cut A Tree”. However, those who have paid for the subscription of Eco News will continue to receive it till their subscription period is over. public who have subscribed to this website. 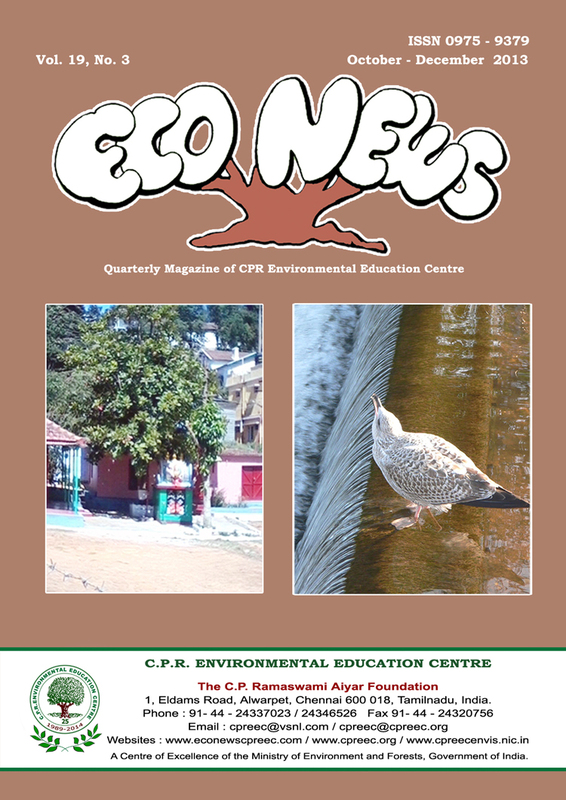 http://www.environmentallawsofindia.com lists, in question-answer format, the various laws to protect the environment, wildlife and animals. 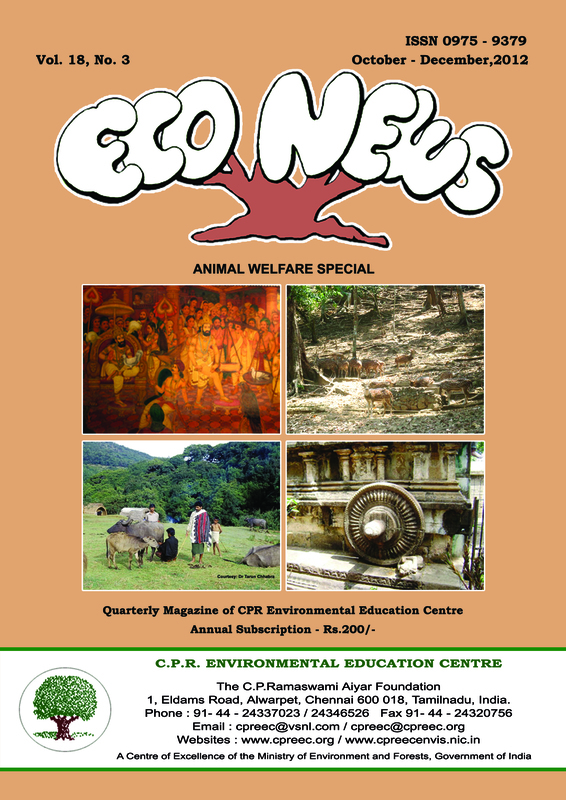 http://www.cpreecenvis.nic.in is a website about the “Ecological Traditions of India and Sacred Sites”. It is a cornucopia of information. And http://www.cpreec.org tells you about C.P.R. Environmental Education Centre. Our educational publications are also freely available online. word “deepavali” – shortened to “divali” – means a row of lights. And the rest of ECONEWS is about various aspects of biodiversity, a diminishing resource today. Water is one of the pre-requisites for life on earth. No living creatures or plant can exist without it. It is also essential for the preservation of the environment. The United Nations has designated the year 2013 as the International Year of Water Cooperation. Water and Biodiversity is also the theme for the International Day for Biological Diversity in 2013. This provides a platform for the parties to the convention on Biological Diversity (CBD) as also the world community in general to be seized of this matter and take pro-active steps to not only create awareness about this vital issue, but also to take positive measures to solve this problem. 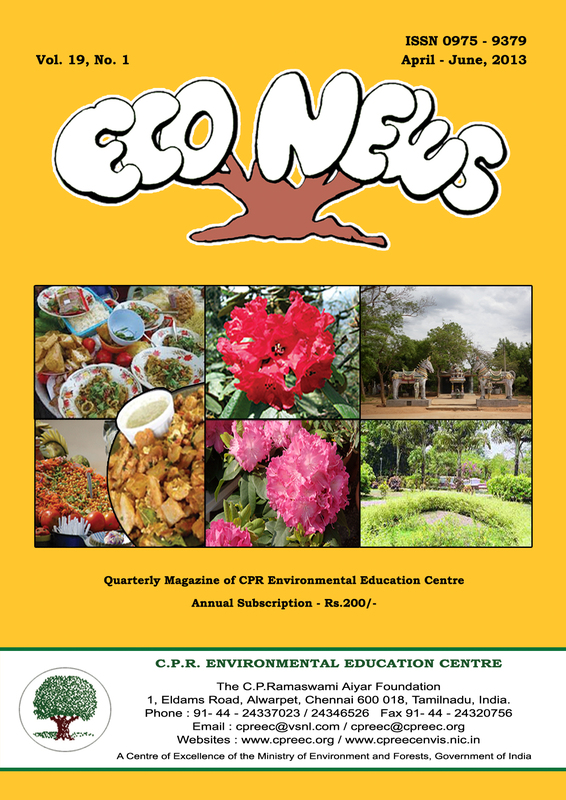 CPREEC, for its part, is bringing out a quarterly Newsletter entitled “Eco News” that focuses on these vital issues affecting our water security as well as the environmental challenges facing our community. M. Amirthalingm writes about Chennai’s shrinking wetlands. P. Sudhakar makes a case for preserving the biodiversity of the parks of Chennai and the importance of protecting these green patches that act as the lungs of Chennai city. Following this, M. Kumaravelu has highlighted the Benagudi Shola sacred grove of the Nilgiris and the cultural and spiritual values that they help to preserve even today. Finally, there is an article on the toxicity of the Musi River in Hyderabad and the spread of Zoonatic diseases through the food habits of birds. 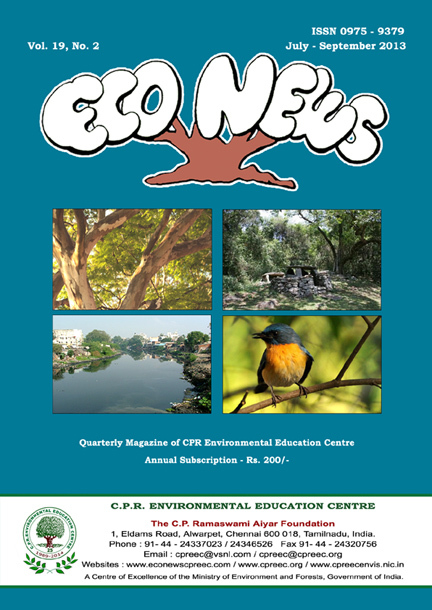 Econews April-June 2013, Vol.19, No.1. 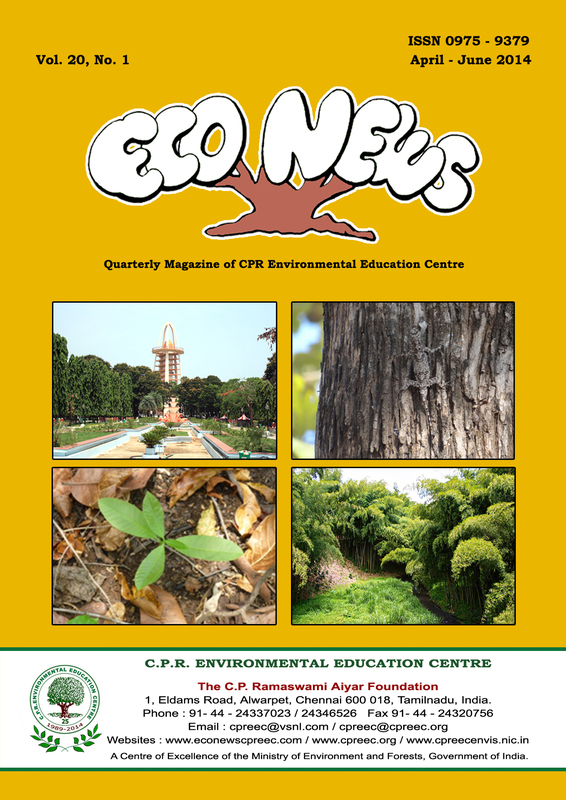 This is the first issue of the Eco News for the year 2013 – 14. The issue covers a variety of topics containing several interesting articles. P. Sudhakar’s article on Parks Vs Green Space. Focuses on the shrinking green spaces in our cities. Parks have gone, substituted by high rise buildings and infrastructure projects. Parks have more exotic species than local plants. These have hampered the green cover and pave way for torrential floods that devastate cities from time to time. The parks of my own childhood in Mumbai and Chennai have been shrinking or disappearing. Marina Beach has been divided between two memorials, vendors of food and toys and the fisherman’s boats and nets. All development on the beach had been banned in British India. 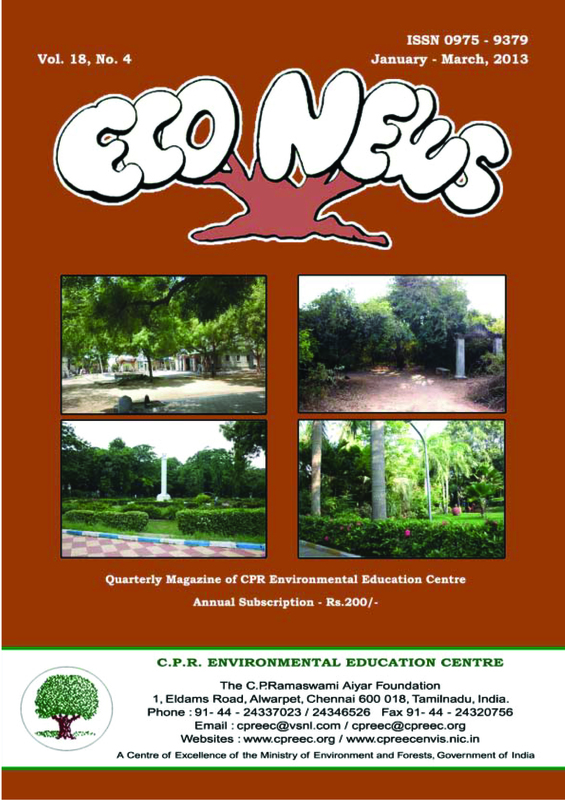 M. Amirthalingam has written an article on Ecosystem services provided by the Thoppainkulam sacred grove. Ecosystem services of forests and sacred groves are in continuous demand. As our forests and green covers shrink, the ecosystem services also shrink. It is not possible to quantify the benefits of green cover. We know that sacred groves provide ground cover and improve the water retention capacity of the soil, while the local species planted in the groves serve as a biodiversity reserve. The Rhododendron of the Nilgiris has many ecological values. It is evident from the fact that the Toda tribes use the branches to make artificial buffalo horns at the entrance of their temples. The culture of the 20th and 21st centuries has resulted in the accumulation of waste : sewage, garbage, hazardous waste, biomedical waste, e-waste, etc. We have an article on the management of the biomedical waste by Dr.Sundaramoorthy, which is a key issue. Street food accounts for sustenance in an economy of increasing food prices, and utilization of synthetic biomaterials is a solution for the future. Every year, flash floods occur and devastate the cities and the need of the hour is environmental protection and adoption of preventive measures. chicken ran around the backyard while the rooster was the village doubtful title of “broiler chicken”. The cow who gave milk continued to live after her milking years were over, and she died a natural death. Bullocks that ploughed the field or pulled the cart were never sold once their productive years were over. All that has changed. CPR Environmental Education Centre (CPREEC) has always been sensitive to animal issues. We serve only vegetarian food in our programmes. We have been talking about animal welfare to teachers and students and including it in our curricula and text books. Our campus overflows with birds, squirrels, dogs, cats and even occasional monkeys, snakes and palm civets. animals which take place behind walls of silence and ignorance. “Invasive and Alien Animal Species in the Andaman & Nicobar Islands” discusses the effects of introduced species on the island’s environment. “The Sacred Cow” tells us that the cow is sacred only in name, while “The Declining Deccani Sheep” is about the survival of an individual breed. “Issues of Animal Welfare in India” discusses problems of rabies and slaughter houses. promote jallikattu (bull tying), a form of bull fighting, today is beyond my comprehension.